Model 50GC SelecTone® Amplified Speaker is designed to produce crisp, clear tones, digital voice messages and live public address. In the Model 50GC a short, folded re-entrant horn is interposed between the diaphragm and surrounding air space. This design provides optimal dBa output and frequency response. 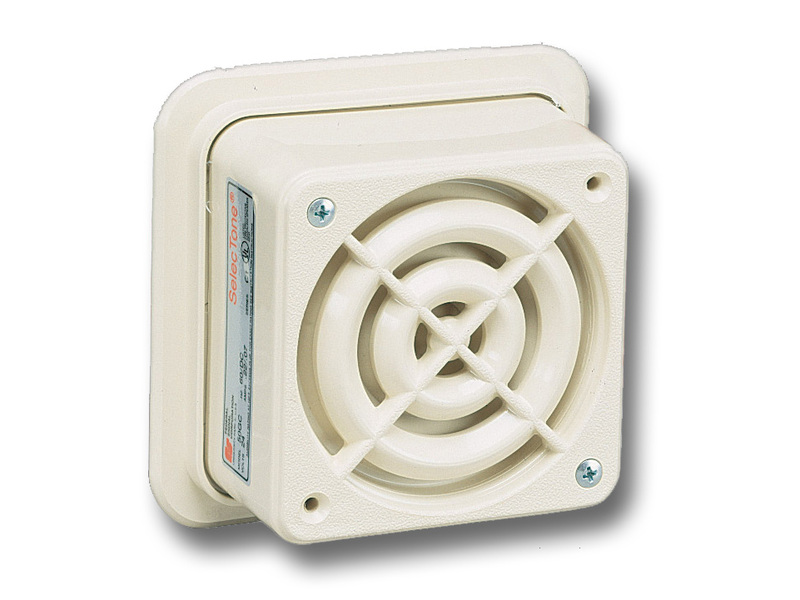 When installed with the Model WB Weatherproof Backbox, the 50GC is suitable for use outdoors. For plant-wide signaling, a Connector Kit is installed into each SelecTone Amplified Speaker and wired to a central controller. SelecTone Command Units and CommCenter® Digital Message Centers broadcast tones, voice messages, melodies and live public address to an unlimited number of SelecTone Amplified Speakers. The compact size and attractive appearance of the Model 50GC make it ideal for use in offices, hallways, reception, and plant areas where ambient noise levels are not exceedingly high, and even sound dispersal is desired. Emergency signaling and paging are common applications. Note: UTM or TM33 required for standalone applications. Connector kits required for system applications.